Using corn syrup and sugar is the best way to get them super fluffy. You can use honey, but it doesn’t taste as good. Gelatin is absolutely essential to get the chewy marshmallow flavor. You can buy plain gelatin in the baking aisle at the grocery store, or buy it on Amazon here. I normally don’t recommend using essential oils internally, but this is one of the few recipes where I love using peppermint essential oil to flavor the marshmallows. It is absolutely imperative that you use high-quality essential oils that have been certified to be used internally. 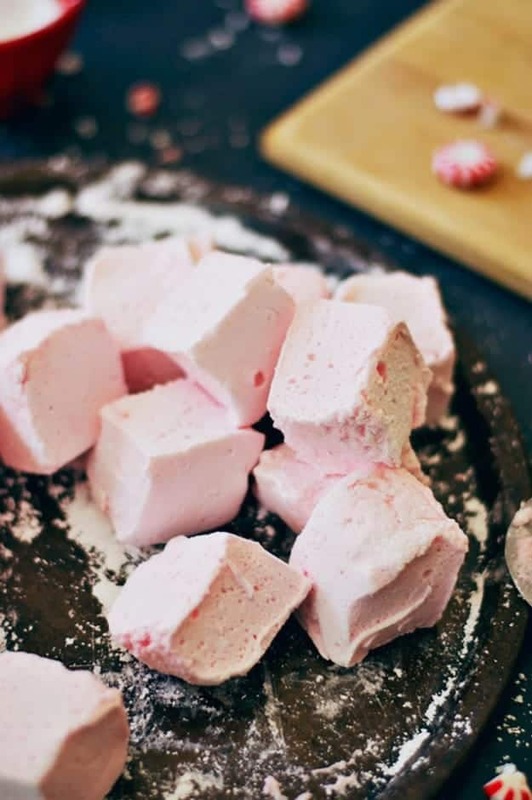 I recommend using this peppermint essential oil for these homemade marshmallows. 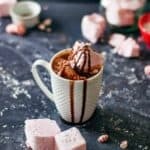 What is healthy hot chocolate? 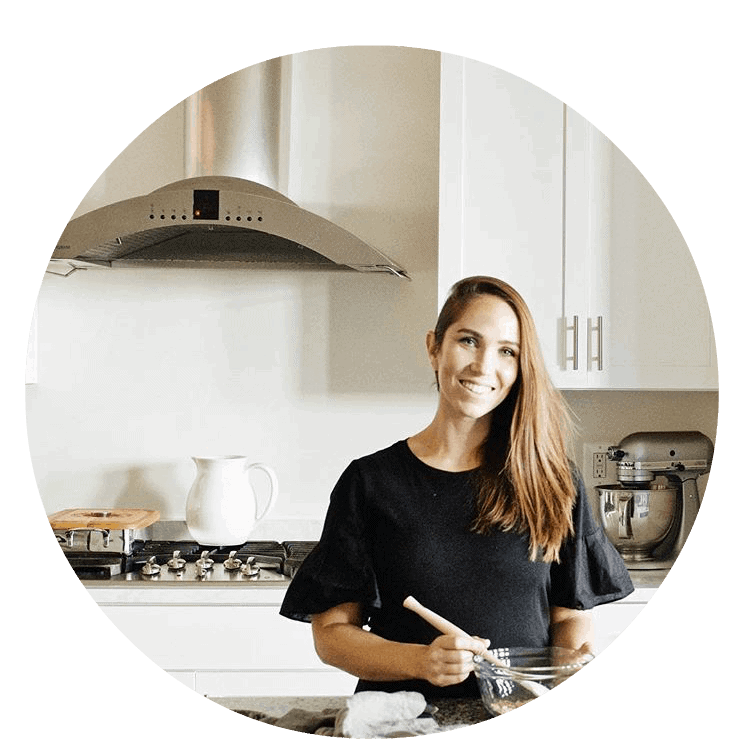 Supporting your thyroid because of the high levels of magnesium and flavonoids in cacao powder. Almond milk or flax milk is a great dairy and allergy replacement, which supports better gut health. Supporting issues with high blood pressure and cholesterol by using stevia as the sweetener, which is an herb that has been linked to lowering both of those ailments. 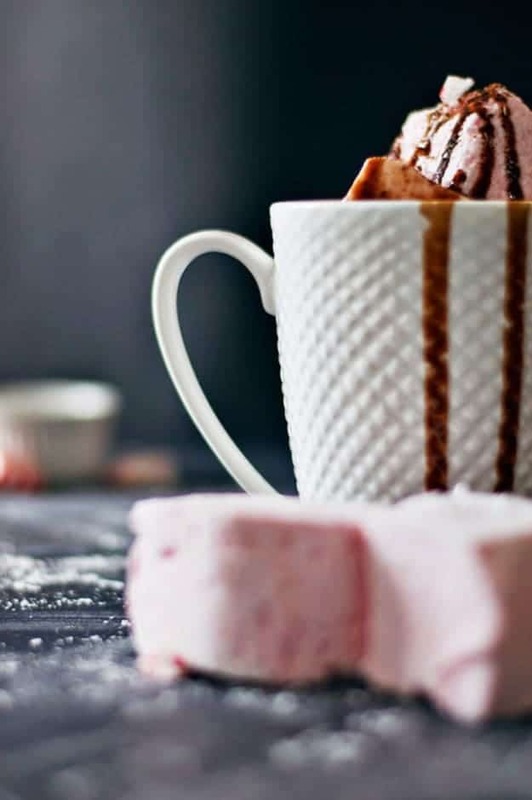 These homemade peppermint marshmallows with healthy hot chocolate are the stuff dreams are made of! 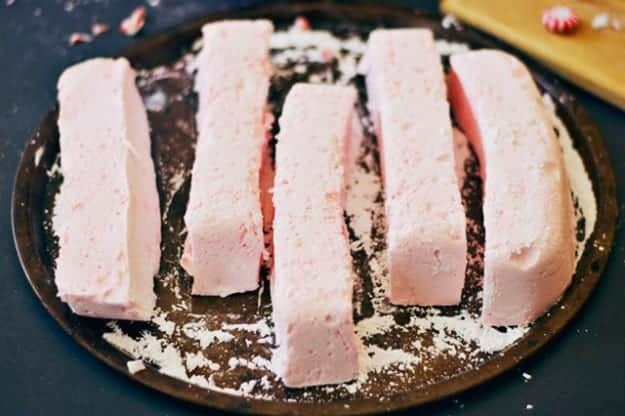 Homemade peppermint marshmallows are what I imagine clouds would taste like if you could pluck them down from the sky when they are having an exceptionally fluffy day. I like to eat them on their own, but they turn into a minty and creamy confection when plopped into a mug of steaming hot chocolate. Like, picture the hot chocolate Judy the elf brings Tim Allen in The Santa Clause. You know the drink I’m talking about! It’s straight from the North Pole. So, is your house decorated for Christmas yet? Ours smells like pine and mint, a combination of which I could never tire! (Until January 1, and I’m all, “Ok, I’m ready for spring! Give me anything you can find in floral print!” 😉 ) We bought our first real Christmas tree this year, and I officially feel like an adult. I don’t know that I can return to the fake Christmas tree option now that a beautiful, 8-foot Douglas Fir is twinkling at me. And did you know you can buy them at Costco?! Forty-five bucks! I KNOW! 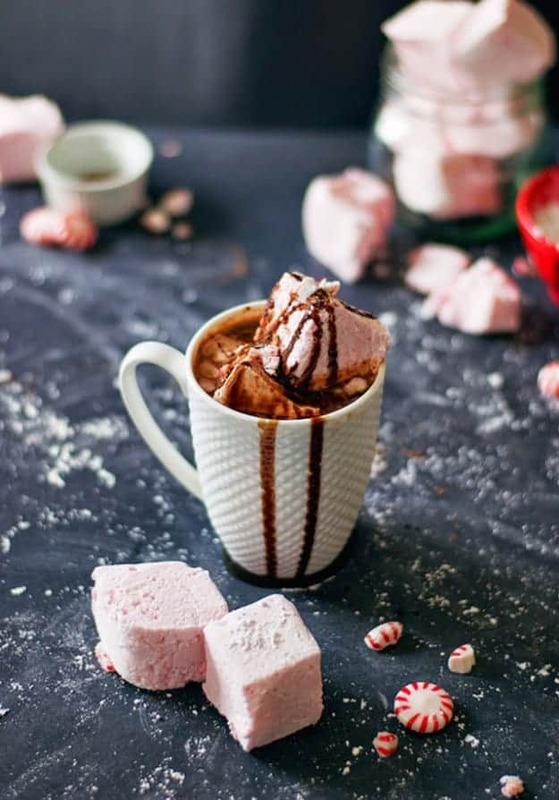 The point here is that you should probably make these peppermint marshmallows with healthy hot chocolate for your decorating festivities, or as a celebration for the cheap tree prices at Costco—or Christmas! You decide. I promise it will make your spirits bright and fill you with Christmas cheer. And don’t forget to sing Jewel’s rendition of “You Were Mint for Me” which is actually about these marshmallows. 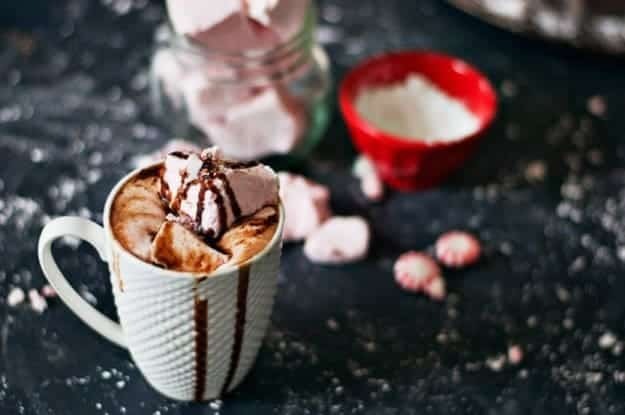 These homemade peppermint marshmallows with healthy hot chocolate are the perfect winter treat. Grease an 8x8 glass baking dish with the butter and then sprinkle about 1 tablespoon of powdered sugar so it is covering the dish. In the bowl of a stand mixer, mix 1/3 cup of gelatin over 1 cup of cold water and set aside. Pour the syrup gently into the gelatin and begin by mixing on low speed for about 6-8 minutes. Once it starts to thicken, add in your peppermint essential oil and food coloring. Turn the speed up to high until it has doubled in size and becomes thick, about 10 minutes. Pour into the baking dish and allow it to set for 8 hours or overnight. Once the marshmallow has set, dust a cutting board or pan with powdered sugar and gently pull the marshmallow mold out. Cut six rows with a sharp knife, about 1 1/2 inch wide, and then cut each row into four squares until you have 24 marshmallows. Dust all of the sticky sides in powdered sugar. Store in a cute jar or container and display them proudly on the counter because they are as beautiful as they are delicious. In a small saucepan, heat your milk, vanilla, and cacao powder over medium heat. Stir with a whisk for about 5-6 minutes until warm. Stir in stevia and cinnamon. Pour your piping hot chocolate into a mug, about 3/4 full. Put one or two peppermint marshmallows in, and drizzle with chocolate syrup and crushed peppermint candies for garnish if you so desire. This stuff is Christmas cheer in a cup, so savor every velvety sip and then go make a cup for someone you love!